£8,662 was raised by 42 supporters — that's teamwork! 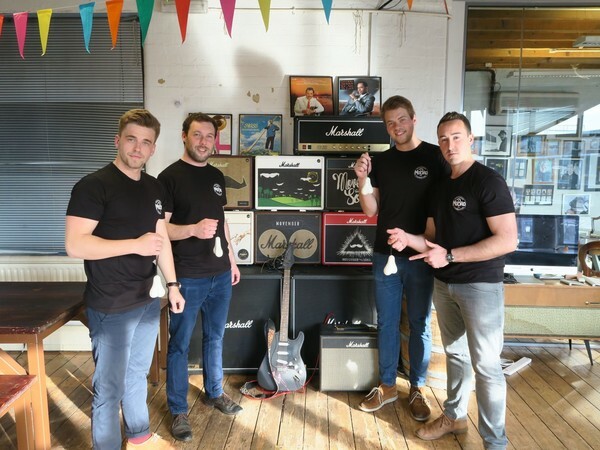 We are Mark, Jon, Steve and Dan, four friends from Bristol that have all been personally affected by the causes The Movember Foundation fight for. We are rowing across the Atlantic in The Talisker Whisky Atlantic Challenge, one of the toughest races on the planet - 4 guys, 1 boat, 3000 miles and a goal to raise £100,000 for The Movember Foundation. The Talisker Whisky Atlantic Challenge saw us leave La Gomera in the Canary Islands on 17th December 2017 and start rowing to Antigua, the Caribbean. We face isolation, 40ft waves, shipping vessels hundreds of times larger than our boat, sleep deprivation and salt sores. It's no wonder that more people have been into space, or climbed Everest than have rowed the Atlantic! The challenge will take 40 to 60 days and you can follow us on social media @bythehundred for all the latest updates and photos from the ocean. Over the last 20 months, we have been working hard on this campaign and have self-funded a lot of the costs to ensure we maximise funds for Movember. We have spent £85,000 of our own money on this challenge, however, we are short of £25,000 to complete the project. Whilst we have the equipment to row the Atlantic we still need to fund transporting the boat home from the finish in Antigua. We were lucky enough to get the boat to the start line through the generosity of people allowing us to delay payments. My mental health suffered whilst I was a teenager due to a spine condition that meant I lost a lot of friends and was unable to undertake any sports. Two years after diagnosis I had two surgeries in 2004. After a week in traction during these surgeries and six months in a back brace post op my confidence and self-belief was incredibly low. I did not talk to anyone about it and felt very isolated. It was only when I met my now best friends at University and started to speak to them about my experiences that I began to feel OK.
As a result of opening up I began undertaking challenges as a way of showing others that, despite my back condition, if I could do it, they could too. Consequently, I have climbed Kilimanjaro dressed as Pacman, kayaked the Zambezi and taken a Mototaxi across the length of Peru. Steve and Dan Baker are brothers and have lost loved ones to both prostate and testicular cancer. Unfortunately, Steve and Jon have also lost old classmates to suicide. When the four of us came together we realised just how much of a positive impact The Movember Foundation has had on men and their families for each of the illnesses/conditions we have been affected by. We wanted to use the Atlantic challenge as a platform to raise a substantial amount of money for them and in turn, help stop men dying too young. Please pledge and share the project with your friends and family. Thanks everyone!! Please share this campaign with your friends and family on social media, it really helps! It is approximately £2 per mile to ship the boat back to the UK so please donate to cover as many miles as you can. Every little helps! In the middle of the Atlantic there is only one way to contact people in an emergency; satellite phone. We have the handsets, but we need help to buy the data. For as little as £15 you will help us ensure we have data for one day on the crossing. This could be the difference between life and death. 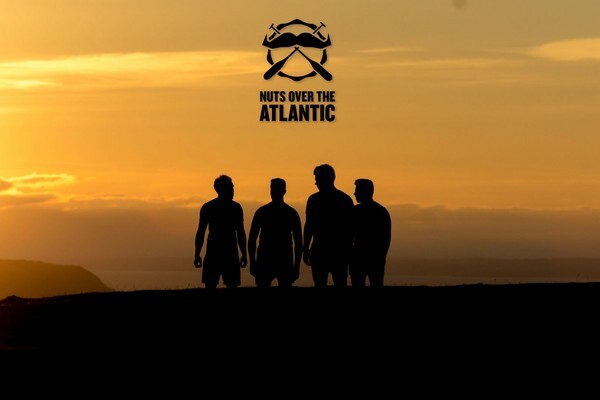 Receive a buff with our iconic 'Nuts over the Atlantic' logo on. Great for keeping your face warm in the winter months! We'll mention you / your company in a post on Facebook, Twitter and Instagram. Receive a personalised Nuts over the Atlantic tshirt with iconic logo. On the top we can put any logo or phrase of your choosing for a truly personal item of clothing! The lesson will take place on our ocean rowing boat and will last an hour. Each lesson can take two beginner rowers. We'll record a personalised message for you from the middle of the Atlantic. Included in the video will be footage of the team rowing and what we're able to see! Sponsor 100 miles of our crossing and we will refer to it continuously as 'The Joe Bloggs miles'. We will shout this out across our social media platforms and any media interviews we have at the time. We'll spend an afternoon with you discussing tips and tricks and lessons learned for how to undertake a life-changing adventure. We will also pass on any relevant contacts for your planned challenge. We will drive the Atlantic ocean rowing boat to a destination of your choosing. You will then have full use of the boat for a day; experience what it would be like to live on it whilst rowing an ocean! The boat can accommodate five people on the water. Travel costs for getting the boat to your destination are not included in this reward. We will drive the Atlantic ocean rowing boat to a destination of your choosing. You will then have full use of the boat for a weekend; experience what it would be like to live on it whilst rowing an ocean! The boat can accommodate five people on the water. Travel costs for getting the boat to your destination are not included in this reward. Hear all about our adventure with a one hour talk at a place of your choosing. The talk contents can be tailored based on what you, your friends or employees are most interested in learning about. Your logo / an image or saying of your choosing on the oar to retain when the challenge is finished. Once the race is complete you will be the owner of an oar used to row the Atlantic! Your logo / an image or saying of your choosing on the boat (approximately 0.10 sq.m.) and our website. Regular mentions across social media. Your logo / an image or saying of your choosing on the boat (approximately 0.25 sq.m.) and our website. Regular mentions across social media. Your logo / an image or saying of your choosing on the boat (approximately 1 sq.m.) and our website. Regular mentions across social media. Your logo / an image or saying of your choosing on the boat (approximately 0.50 sq.m.) and our website. Regular mentions across social media.